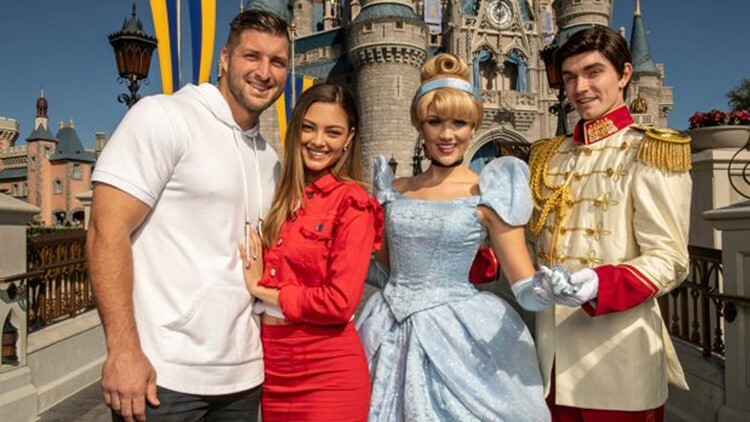 Tim Tebow and Demi-Leigh Nel-Peters meet Cinderella and Prince Charming at the Magic Kingdom. The Heisman Trophy winner turned baseball player announced Thursday he and Miss Universe 2017 Demi-Leigh Nel-Peters are engaged. ORLANDO, Fla. -- Tim Tebow, you just popped the question. What are you doing to do next? Obviously, go to Disney World! The Heisman Trophy winner turned baseball player announced Thursday he and Miss Universe 2017 Demi-Leigh Nel-Peters had gotten engaged, and the happy couple celebrated with a trip to the Magic Kingdom, the park's official blog said Friday. The website had photos of the two with Cinderella and Prince Charming, and also showed them enjoying a flight on the Dumbo ride. It was the first trip to Disney for Nel-Peters.